Weekends in London, there is always something to do. Always. Coming up on the home stretch of the school year, it’s normal for students to get super stressed, lock themselves in their rooms, and do nothing but worrying about studying (which has been witnessed in both myself and quite a few classmates.) So we’ve come to realize that it’s really important for us to get out of our rooms for at least a couple hours to take a break, and force ourselves to do something fun. Thankfully, studying in London makes that extremely easy, since in any part of the city and at any time of the day, something will be going on. This weekend, myself and a couple classmates delved into the English tradition of celebrating the Feast of St. George. 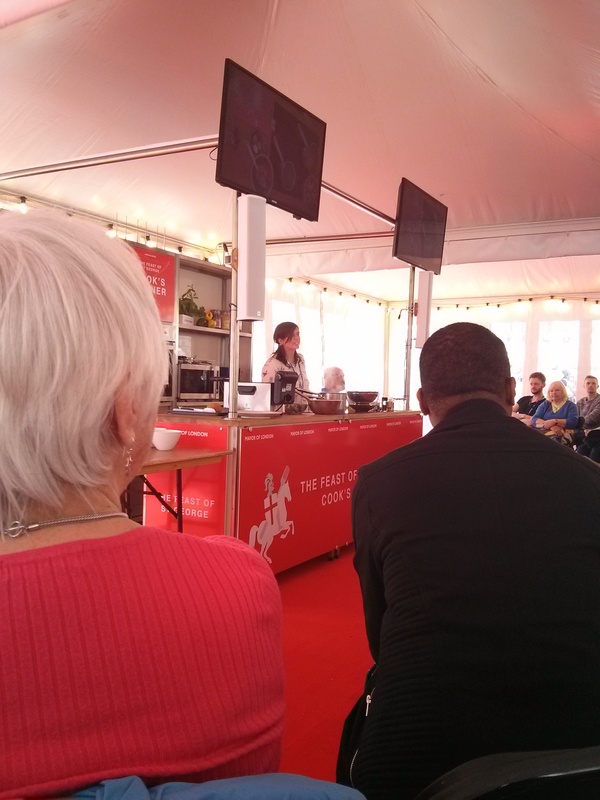 We got the chance to sit and watch 2013 Masterchef winner, Natalie Coleman make Scotch eggs. What I learned is that they look delicious, and I should probably learn more about famous British chefs. 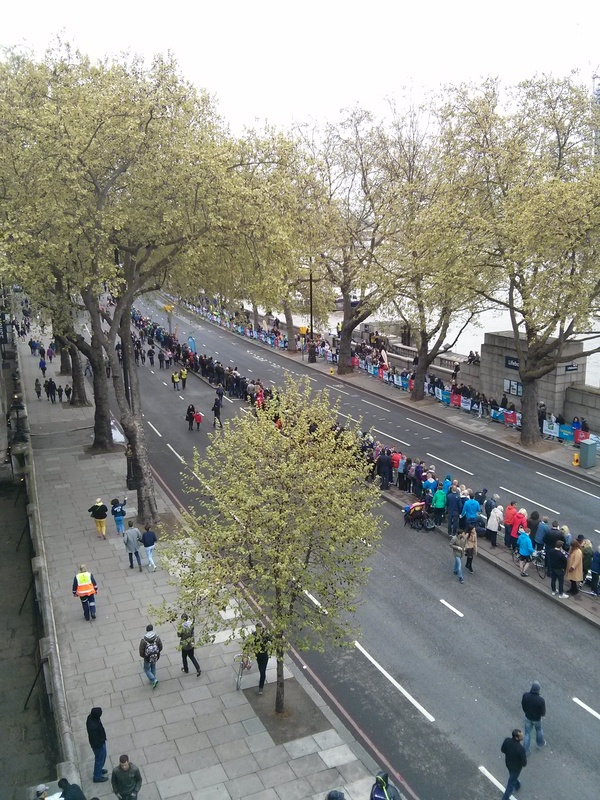 Another fun thing that happened this weekend in London was one that always grabs international attention: The London Marathon! 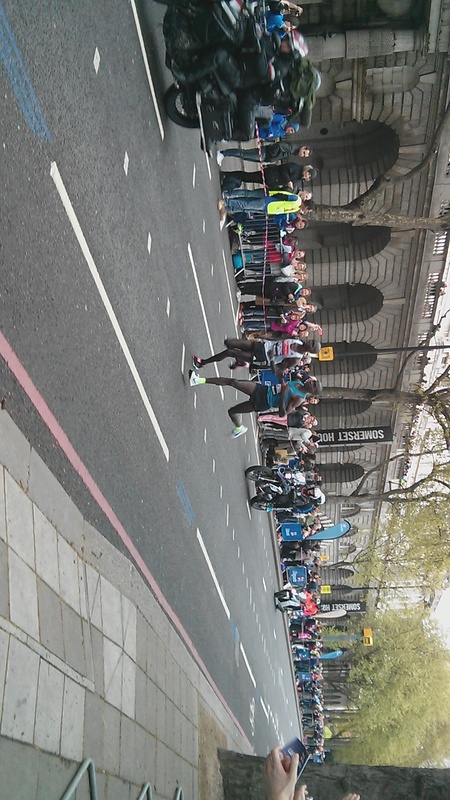 So, it’s always a fun and motivating experience getting to go and see the marathon runners, even if you don’t personally know anybody running. The London Marathon is unique to any that I’ve ever been a spectator at, because heading the whole race are amazing athletes, the world champion wheelchair runners. And can I just say I was filled with extra pride at this, because the 1st place winners of both men and women were both representing the United States! Behind them was also the IPC runners, or International Paralympic Committee, which included runners who were leg/arm amputees, running with and without prosthetics, and visually impaired racers who ran with their guides. After seeing these inspirational runners, we only stuck around a bit longer to see the men and women’s elite runners, where we got to see those who would, in about a mile and a half from where we were, take the top places. If we weren’t there for nearly two hours by this point and starving, we would have stayed for the rest of the runners, since from many other posts I’ve seen there were some very exciting costumes present! But even before the bulk of the racers got to mile 24.5, there were still loads of people lining the streets, and it was so great to see everyone come out and support them. It just makes for a really positive and happy environment to be in for a couple hours, all standing together and cheering for the same thing, just wanting to see everyone finish and have fun. 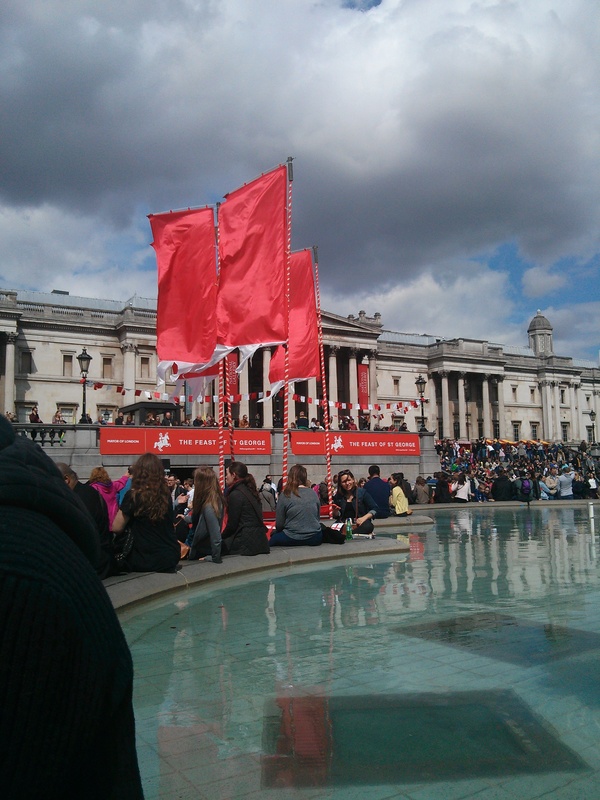 This weekend was a fairly eventful one, but there is always something happening on London weekends. And when you’re doing almost nothing but studying and schoolwork during the week, having all sorts of events happening on weekends make for a great relief! And I know I mention being so stressed and busy with school quite a bit, but don’t get me wrong, I absolutely love my school, and love what I’m here doing! And between my school and the city, I’m so happy I came to study here. Seriously, if you’re on the fence about studying abroad, my advice is: DO IT! 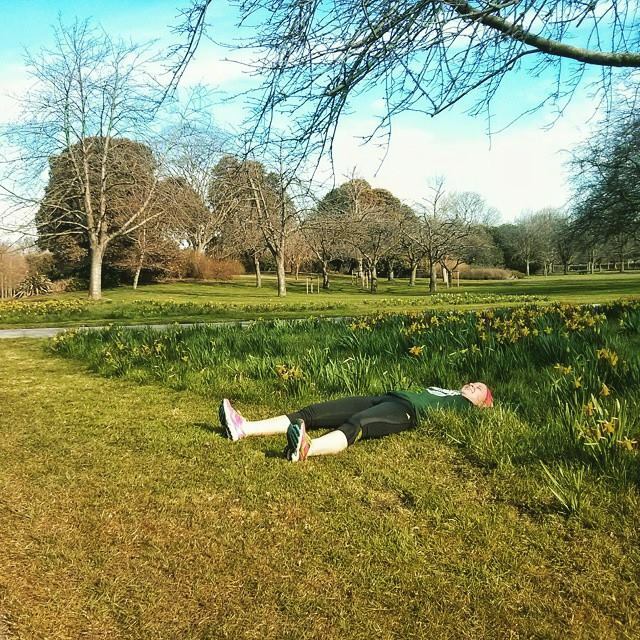 To see more about what’s to love, check out the Study London page: My Top Five Reasons for Studying at LSHTM! 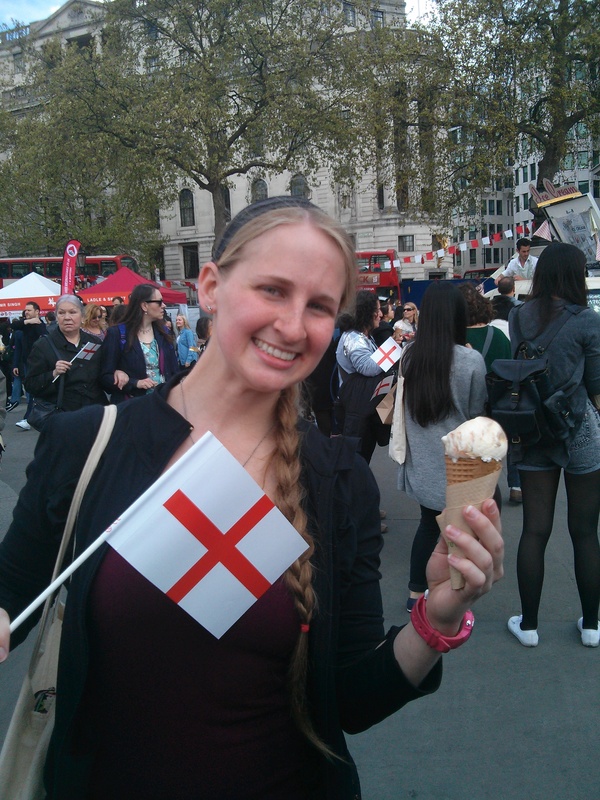 This entry was posted in Feast of St. George, London, London Marathon, LUIP, Study Abroad, Study London, Uncategorized and tagged Feast of St. George, London, London Marathon, LSHTM, LUIP, Marathon, Running, Science In London, Study Abroad, Study London, weekend. Bookmark the permalink.